Please note that the content of this book primarily consists of articles available from Wikipedia or other free sources online. 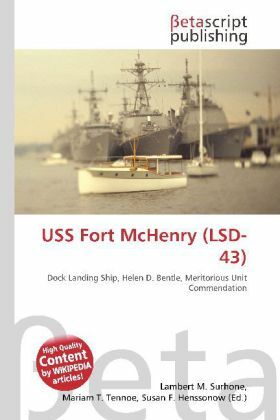 USS Fort McHenry (LSD-43) is a Whidbey Island-class dock landing ship of the United States Navy. She was named for Fort McHenry, in Baltimore, Maryland, the 1814 defense of which inspired The Star-Spangled Banner. USS Fort McHenry (LSD-43) was laid down on 10 June 1983 by Lockheed Shipbuilding in Seattle, Washington. She was launched on 1 February 1986 (sponsored by The Honorable Helen D. Bentley), and commissioned on 8 August 1987 in Seattle, Commander George S. "Dusty" Rhodes in command.